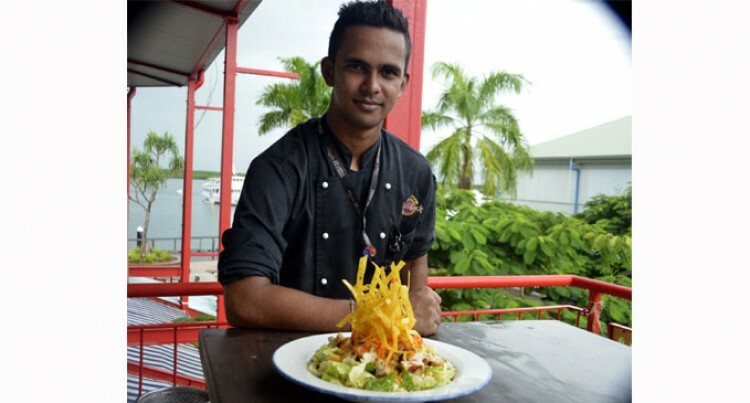 Today, you have the chance to whip up a special menu that you could find at the Hard Rock café in Nadi. Our guest is chef de partie Krishneel Chandra, who will give you an idea of how to put together a hey stack chicken salad. Mr Chandra has been associated with Hard Rock since 2007 after completing his studies and fell in love with food since his primary school days. Hard Rock franchise of Jack’s group. Chef de partie Krishneel Chandra. Born and bred in Waimalika, four minutes drive to the Nadi International Airport. He had a love for cooking since primary school. “I had this great idea to understand cooking as people often link chef to just cooking but it has a bigger picture attached to it where fine dining and presentation is far more in the catering industry,” he said. Mr Chandra, 25, has been associated with Hard Rock since 2007 after completing his vocational trade certificate at Ratu Navula College. He even went on to work at Vomo Island Resort. “Hard Rock is a different class restaurant with a lot of customer coming especially for this salad,” said Mr Chandra.